Artist rendering of renovations at Coastline Park. Sanford City Commissioners approved $1 million in funding to upgrade Coastline Park in Goldsboro in an effort to establish it as one of the premier parks in Sanford. Located at West 9th Street and South Popular Avenue, the park sits on the site of the old Seaboard Coastline railroad station. As a nod to the site’s history, the renovations at Coastline Park will have a railroad theme. 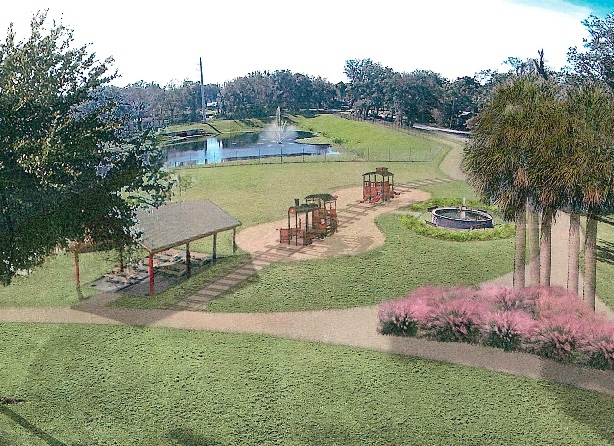 Ovation Construction of Oviedo has been chosen to do the renovations, which include new playground equipment, landscaping, irrigation, lighting, a picnic pavilion and bike racks, as well as upgrades to the basketball courts, tennis courts and restroom facilities. Renovations will also be made to the park’s old coquina fountain, which was part of part of a Civil War-era medical facility that stood near the site. The upgrades will establish Coastline Park as the trail head for the Goldsboro Trail, which currently is a 1-mile trail starting at the park a follows an old rail bed to the intersection of South Oleander Avenue and Country Club Circle. Work is scheduled to begin in June and is expected to be completed by January.